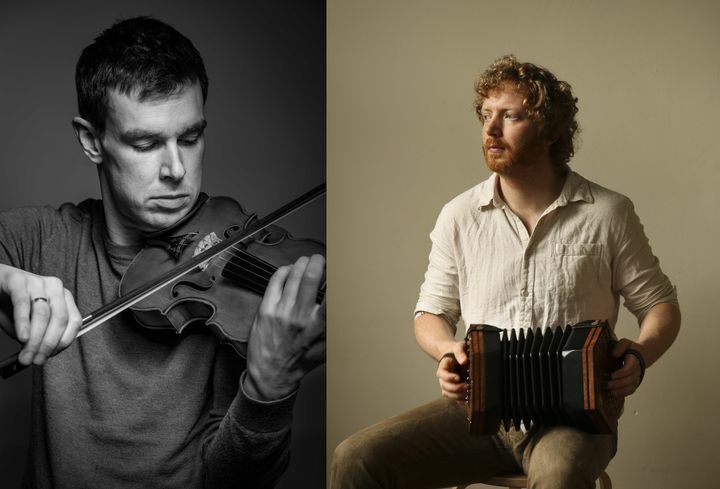 Liam O Connor and Cormac Begley played to a sold out concert in National Concert Hall in October 2017 and will play their first national tour in April 2018. Liam O’Connor, one of Ireland’s leading fiddle players, was born into a musical family in Dublin. His solo CD “The Loom” received 5 star reviews and was voted Trad Album of the Year 2017 by the Irish Times. Cormac Begley is a bass, baritone, treble and piccolo concertina player from a West-Kerry musical family. His debut solo album, released in May 2017, has received critical acclaim amassing seven 5-star reviews to date (e.g., ★★★★★ in Irish Times, Folking and Irish Echo). During his youth, Liam was taught by Séamus Glackin. By age of 15 he had won 5 All Ireland fiddle championships and later added junior and senior Oireachtas fiddle competitions. He also completed all 8 grades in Classical violin training in the DIT College of Music, Dublin. In addition to performing as a soloist from a young age, in his teenage years he was also invited to perform in duet with established masters such as uillleann piper Liam O Flynn and concertina legend Noel Hill. He was awarded TG4 Young Musician of the Year in 2002. At the time, Liam was described in the Irish Times as ‘Possibly one of the most exciting fiddle players on the music scene since the emergence of Sean Keane and Frankie Gavin more than 30 years ago. He has an exceptional natural ability and the standard of his playing defies logic given his age’. Cormac Begley is a bass, baritone, treble and piccolo concertina player from a West-Kerry musical family. He plays in a number of projects including: duets with Rushad Eggleston (cellist), Clíodhna Ní Bheaglaoich (fiddle, viola and sean nós dancer), Liam O Connor (fiddle), Caoimhín O Raghallaigh (Hardanger Amore) and Liam Ó Maonlaí (singer and multi-instrumentalist); a trio entitled Concertina (with Noel Hill and Jack Talty); and with the band Ré. He is the founder of Airt and the award-winning Tunes in the Church live concert series in Galway and Dublin. His debut solo album, released in May 2017, has received critical acclaim amassing seven 5-star reviews to date (e.g., ★★★★★ in Irish Times, Folking and Irish Echo). He is currently the artist in the Dock Arts Centre in Carrick On Shannon, Leitrim (November to mid-February) and will be the traditional artist in residence in the National Concert Hall in 2018.